The doctor convicted of involuntarily killing Michael Jackson appeared to be on trial again Wednesday as a lawyer for Jackson’s mother tried to show the physician’s desperate financial situation drove him to extremes in his treatment of the superstar. 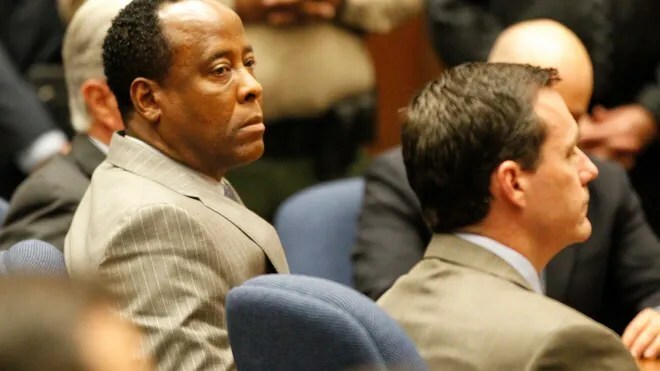 Attorney Brian Panish, questioning a police detective, hammered away at the depths of debt that enveloped Conrad Murray when he agreed to give Jackson what he wanted — infusions of the powerful anesthetic propofol to make him sleep. The pop star offered Murray $150,000 a month to travel with him on his ill-fated “This Is It” concert tour. AEG Live LLC, the concert promoter, reluctantly agreed, according to testimony in the doctor’s criminal case by AEG executives. Panish used the testimony of police detective Orlando Martinez to suggest that if AEG had investigated Murray’s background, it would have found a man so encumbered by debt that he was not trustworthy. The testimony came during the trial of the negligence lawsuit filed by Katherine Jackson claiming AEG didn’t properly investigate the doctor who gave her son a lethal dose of propofol. The company denies wrongdoing. A coroner ruled that the 50-year-old star died of the overdose of propofol in his bed on June 25, 2009, while under Murray’s care. The drug was not intended for home use. Martinez, who was lead investigator on Jackson’s death, said he discovered that Murray faced student loans, home loans, child support obligations and credit card payments that were in arrears in 2009. Panish said the debts totaled nearly $1 million.